1. Rinse the quinoa in cold water, either put in a strainer and use running water for a couple of minutes or immerse in a pan, changing the water a few times. This removes the bitter taste which can otherwise occur. 3. Heat olive oil in a skillet or saucepan and toss the drained quinoa in the oil, lightly cooking for about one minute till all the remaining water evaporates. 4. Add water or stock and bring to the boil, adding pinch of salt, if required. Turn heat down, cover the pan and simmer for 15 minutes. 5. After cooking leave the quinoa to stand for 5 minutes before uncovering the pan. 6. Stir the quinoa to make it light and fluffy. You can now add butter, olive oil, and salt and pepper as required. 7. If not for immediate use, this pre-cooked quinoa can be used subsequently for salads, side dishes or as the base ingredient for dishes which normally are rice-based. 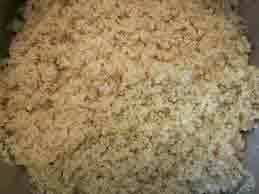 However, quinoa does not have the required consistency to make a successful risotto. 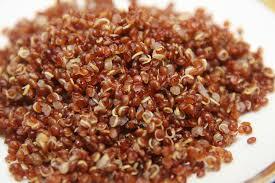 Quinoa can also replace oats when making porridge. Add 1/2 cup pre-washed quinoa and 1 cup water to a medium sized saucepan and add seasoning (e.g. pinch of salt) according to taste. Bring to a boil and cook for 5 minutes, stirring often but otherwise leaving the lid on. Lower the flame if necessary. Turn off heat and cover. Leave to stand for 15 minutes before serving.